If you enjoy crispy medium-rare duck breasts in restaurants, you should give them a shot at home. No, it's not hard. In my opinion, dicing a carrot takes way more practice and skill than searing a duck breast. You do need a sharp knife, and a decent skillet, but that's pretty much it. If you want a sauce, the skillet has to be stainless steel. Otherwise, choose any skillet you want and get cooking. The breasts I am using in the video are from Long Island ducks (also known as Pekin). They are the most widely available in the stores. These ducks are small and very tender. Their breasts weigh 6-8 oz each and serve one person. Other varieties you might encounter are Muscovy and Moulard. Both are much larger than Long Island with one breast weighing about 1 Lb and serving 2 people. They are also a lot tougher. While all duck types benefit from pre-salting a day before cooking, it's particularly helpful with Muscovy and Moulard varieties to help them stay juicy and tender. I believe that you should never cook duck breasts past medium-rare (take off the heat around 120F and they'll rise to 130F during rest). If you want to make it more done, stick to Long Island duck. At higher temperatures, it will be drier, but still tender. Muscovy and Moulard have fabulous flavor, but the texture will be as pleasant as shoe leather if they go much above 130F. I usually take them off the heat at 115F to be on the safe side. They are so large that they need to rest for 7-10 minutes and will easily get to 125F-130F. Before you get started, preheat the oven to 350F (so that it's ready by the time you finish rendering fat and searing the outside of the duck). The skin is so thick on these larger ducks that it will take around 15 minutes of cooking in the skillet on low heat to render most of its fat. You want the skin to be about 1/4 of an inch before you proceed to the step of pouring off the fat and browning the skin. After you flip the duck onto the flesh side, give it a couple of minutes on the stove top and check internal temperature. Most likely, you won't be at 115F yet, so finish cooking the breasts in the middle of the oven until you get there. It will take 5-10 minutes. What does medium-rare look like? Keep in mind that medium-rare is a temperature, not a color. 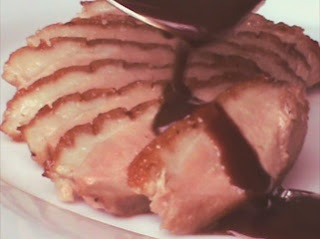 Internal color of medium-rare duck depends on many factors. Long Island duck will be pink-beige. Muscovy and Moulard will look more red-purple (more like beef). If the duck was previously frozen, it might look more gray than red. Last time I wrote about salt was in 2006, so it's time to revisit the subject. I'll kick off a series about this favorite topic of mine with an interview with Tony Maws -- the chef from Craigie on Main. If you are from the Boston area, Tony hardly needs an introduction (2 hands aren't enough to count the awards he's won). I am not big on awards, but it is the only restaurant I found in Boston that seasons food just the way I like it. I want to say a huge thank you to Tony for taking time to talk to me. Do you think there is a correct amount of salt for each dish or is it completely a matter of taste? Of course it’s a matter of taste. And even the same person will taste salt differently in different parts of the day or based on different conditions. When you are dehydrated, you crave salt. The cooks are hot and sweaty, so they’ll want more salt than other people. You get addicted to salt. The more you eat it, the more you want it. Sometimes young cooks start over-salting. Given that the right amount of salt is completely subjective, how do you decide how much salt to put in food? Your body begins to taste salinity at about 0.7- 0.75% of the weight. That can be skewed by fat because it coats your palette differently, or by acid. Some of our recipes are based on that. Some are based on 1%. It all depends. If I am seasoning a pork belly, I might treat it one way for one dish and a different way for another dish. Do you ever weigh salt when you are seasoning? We weigh salt when we are brining or curing because there is more of a process to it, but normally we don’t weigh salt when seasoning. How do you ensure the right level of salt is used for every dish when you have many line cooks producing the dishes? I am always cooking with them. I always taste what they make. Even if one of my cooks has made the same soup 20 times, he always brings me a taste of it. What about proteins? You can’t exactly take a bite of a fish fillet or a steak. Which proteins do you season right before cooking and which ones in advance? I believe strongly in seasoning all meat, poultry, and fish ahead. I want to get as much flavor into a dish as possible. That doesn’t mean I want it to be over-salted, but if you season something ahead of time it will reach equilibrium. How far in advance do you season? It all depends. Fish is more fragile, so we season right before service. About 30 minutes in advance is good. But we don’t season it a day ahead unless we are curing. Meats and poultry need a lot longer (at least several hours). How do you decide which proteins to brine and which ones to salt? There are no hard and fast rules with this. I don’t generally brine steak. I brine some of our veal and lamb. Not all. I don’t brine fish with high water content (like cod) because I don’t need to introduce any more water into them. I salt them ahead. But I do brine salmon, arctic char, and swordfish to make them more juicy. 5% solution for 10 minutes [this means the salt amount is 5% of the water amount by weight]. Do you adjust the amount of salt based on the cooking method? Yes. For example, I season braises differently than I season roast meats. I season the meat liberally when it’s going to be roasted. When I braise, I season the meat itself, but I don’t season braising liquid because it might be reduced later. But you can’t just add salt in the end because then it will just taste salty. That’s the bottom line. A lot of our food is building layers of flavor. We sweat the onions and shallots, then we deglaze with wine, then we add mushrooms, then we add stock. If you only add salt in the end of this process, it’s amazing what happens. It’s not in harmony. You taste salt. But if you season at every step of the way, it’s much more harmonious. You actually end up using maybe a bit less salt because it brings out the flavor. Fine gray sea salt from France, course gray sea salt, coarse pickling salt, kosher salt, fleur de sel, malden. They do taste different. Salinity comes across in different ways. Malden salt is delicious. It has a really large flake. That doesn’t mean you can’t grind it and make it fine. Many of those sound like finishing salts. What if you are seasoning a fish fillet before cooking, what would you use? Gray sea salt. I love the natural minerality of it. It tastes like the sea and goes great with fish. If you had to live with one salt at home, what would you use? Probably gray sea salt. Standard kosher is fine too. In the end of the interview, Tony recommended that I read Mark Kurlansky's book on Salt. Few fish cooking methods are more delightful than searing a fillet in the skillet to produce a perfectly crispy skin and juicy flesh. No wonder this technique became the darling of restaurant chefs. But when you try to do it at home, here is what often happens: the fish sticks to the pan, refuses to brown, and some species curl up leaving you with rubbery skin and unevenly cooked flesh. Here is a video that will solve all of your fish searing problems so that you can sear like a pro.